STEM is an educational approach focused on the important foundations of science, technology, engineering, and math, with curriculum and activities encouraging young minds to explore these subject areas in unique and hands-on ways. Here at St. Norbert’s, we also incorporate the arts into this platform and integrate the teachings of our Catholic faith throughout all we do. As a result, every day our students are Powered by Our Faith through C-STEAM (Catholic – Science, Technology, Engineering, Arts, Math)! In our PreK classroom, Mrs. Donaher proves that it’s never too early to start putting C-STEAM in action. Read on to learn about how she brings this approach alive for her young students. C-STEAM is a thought process. Instead of academic learning (memorizing, practicing, counting, reciting), C-STEAM is intellectual learning (reasoning, predicting, problem solving, hypothesizing). This takes place in the PreK classroom through hands-on activities that are interactive and fun. 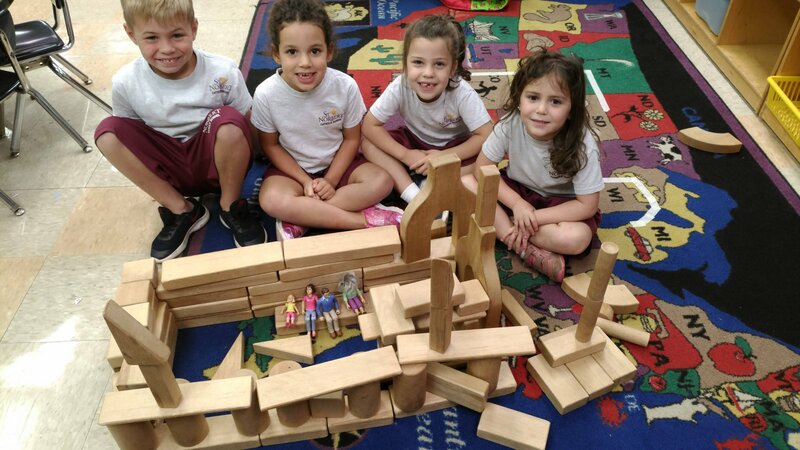 What looks like “play” to most people is a carefully constructed environment where the children are encouraged to ask questions, hypothesize, discuss their observations, and come up with conclusions. I make it a point not to interrupt this thought process because watching them make their own discoveries is a sacred experience. It’s how I perceive God at work in the human mind. – Halloween Block Center Objective: Build a haunted house so that your baby ghost (use a tissue with eyes) won’t be able to float out and away while family ghost members are sleeping. Explain your construction. – Alphabet Objective: Use strips of paper to make the letters of the alphabet. Glue into a book to share with classmates. – Weight Objective: Hold two objects (e.g., matchbox car, balloon) and predict which one is heavier. Test your hypothesis with a pan scale. Record results. – Pattern Objective: Using tweezers and small pom poms, create ABCABC patterns. Ask a partner to predict what shape/color will come next. Have them add to your pattern. 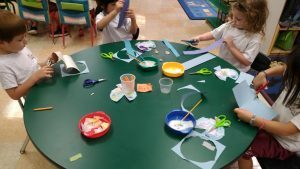 – Science Objective: Can a rubber fly slide down a sliding board? If not, what can be used to get the fly down the slide? Show the class what you used to get your fly down the slide. 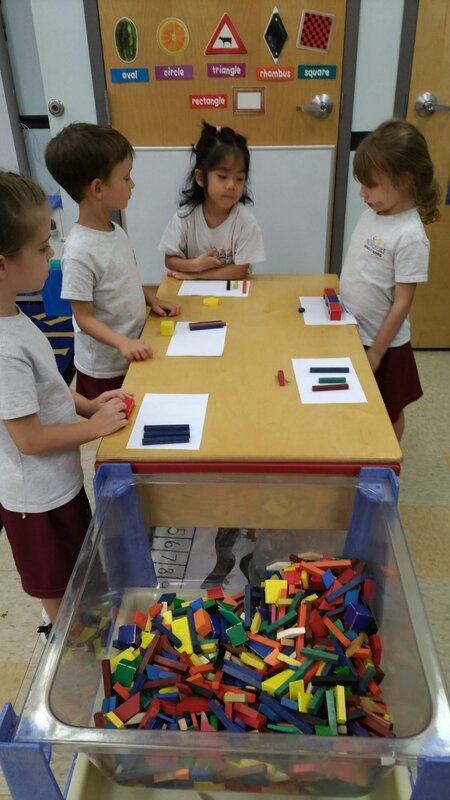 The next time you’re walking past the PreK classroom, look in and see young minds working hard at play! Stay tuned for more on C-STEAM in future blog posts.